Both sectors, production as well as consumption, must be regulated by democracy, which itself has to relate to money. If democracy is not related to money, all the people’s democratic efforts will be destroyed by the power money can assume. So unless money has become a full rights document in which the production sector and the consumption sector are embedded in our society, it will continue to ensure the decline of human creativity, of the human soul, of the power of human creation, and the life of nature! “And How money will work in the future – is that every individual becomes a participant by developing awareness of his own sovereignty and by promoting right concepts about just laws of the economy which have to prevail in future. This is where I very clearly state that every human being is an artist creating new social forms. If every person is an artist in this realm of social sculpture, it follows naturally […] But then it’s true that we must consider the individual’s aptitude, shall we say, with which he or she creates. We should discuss only the potential of each human being to shape social forms, to shape the future, to create the new social organism. How can all the planet’s inhabitants cooperate economically for the benefit of all, without an iron curtain, without borders, without weapons of the destruction of natural resources? The undisputed axioms boil down to the fact that people know things have to be resolved democratically and that human beings must be perceived and viewed as free beings, bearers of the impulse for freedom. People have to understand the role of freedom and democracy, meaning, how freedom and democracy work together. This is the vantage point where they can see how the economies of capitalism and communism both fail. Yes, this is where they can develop such knowledge and act on it. In doing so, people will have to develop imaginative concepts of the future shape of society – in the same way that the sculptor naturally has an imaginative concept of the shape of his sculpture. Their knowledge will organize itself in their consciousness and they will realize that money represents only one of the problems, though maybe one of the key problems of future social systems. […] Marx said it clearly, and in this Marx was right! How do people expect to achieve all these things which a sense of freedom tells them are desirable, self-determination at work, equal right and solidarity in the economy, in other words, a non-profiteering economy which works for the benefit of people and nature? How do people expect to get to this level of awareness unless, shall we say, they engage with this social form and experience how, very similar it is to the form of the human being? In other words, the power of money which prevents people from unfolding their capacities and realizing their aims has to end; the power of money has to be broken. But this doesn’t mean that money should be abolished; it is the meaning of money as an economic commodity which has to be abolished. […] Now that it is a commodity, we have to break this character and transpose it into a democratic totality. Because money, in its essential nature – and here we are concerned with insight into the whole of society – is a document of rights. ‘Geld’ [Money] comes from ‘Gold’, same etymology. But it comes equally from ‘Geltung’ (Validity), meaning the value people fix based on their perception of a natural right. So, people’s creativity is, shall we say, rewarded with a bit of merchandise and by something which should no longer exist in the economy” The result is of course the polarity between capital and labour […] (People) now want self determination at work, so that we may finally consider the monetary system’s next metamorphosis into an economy of creative capacities! Money, still harmful now in the economy because it is possible to buy it and to speculate with it, and because of the polarization between employers and employees, must lose this status and shift into what it is essentially today in people’s consciousness as a regulator of rights for all creative processes. In other words, overall, money has to express rights and duties. I say duties very consciously , because many people imagine that with the evolution of society we only have rights left! No, on the contrary: we have both. With the acquisition of new rights for everyone in the realms of work, new obligations also appear. Considering that an illness generally precedes a death, at least we can say money is sick! And for it to be healthy again, we need new terms for this monetary system, and new forms. If I look for the objective nature of money, I conclude today that the illness is rooted in the fact money is still an economic value in the economy, and that sick money will only be cured if money is recognized as a document of rights […] Money has to undergo a metamorphosis again, it has to relinquish its role in the market economy and engage in an economy of capacities. Then we would be concerned with human creative productivity. And we would come full circle, since each human being can then act within his company as co-creator of the future, can – in full dignity – contribute to shaping this future. Wage dependency, private ownership of the mans of production, and profit as the driving force! These concepts are responsible for making the whole society sick and pushing humanity down into an abyss. I myself support the idea that money should be a mandate – but more completely! – a document of rights […] At the beginning I spoke of the axioms for the future of our society. In and of themselves, they are irrevocably established! They are non-negotiable: equality and freedom. Both. People today are essentially selfish. But at the next phase of our social will, potentially innate in all of us – if let’s just say we thin of ourselves as Christians – we will act to promote better human community. I don’t support a planning apparatus in the old Soviet style but of enterprises in their free creative form. We don’t have them. We only have private economy enterprises and state enterprises. Neither of these principles works. 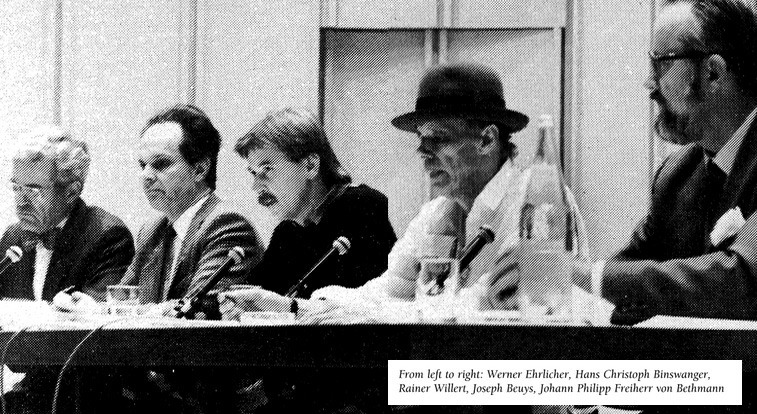 Beuys, Joseph., Rosch, Ulrich et al What is Money? – A Discussion with J. Philipp von Bethmann, H. Binswanger, W. Ehrlicher, and R. Willert. 2nd Edition. Clairview Books, 2010. Print. Utilizando la lengua llegaremos a apoyarnos los unos a los otros y descubriremos que hablando así es posible encontrar la curación psíquica, y también experimentar un sentimiento profundo, elemental de lo que pasa sobre el suelo donde vivimos. Una forma de arte, en todo caso que me ha guiado hacia un concepto de lo plástico es un concepto que tiene su origen en la palabra y el pensamiento, y que al hablar enseña a forjar conceptos que pueden dar forma, y que darán forma al movimiento y la voluntad. “De esta manera me he sentido invitado a buscar lo que exprese esta forma algo que se refiera a la crisis, no sólo de nuestro pueblo, sino la crisis del mundo entero, del mismo modo la deformidad que marca por todas partes al organismo social. Esto significa para mí, establecer condiciones, un humus hecho de conceptos y de representaciones sobre el cual pueda realmente crecer una forma viva, se ha convertido cada vez más en el deber de la creación, en el imperativo del artista plástico. Vamos juntos a desarrollar el concepto social del arte en tanto que fruto de las antiguas disciplinas. Consideramos las disciplinas tradicionales como la pintura, la escultura, la arquitectura, la música, la danza, la poesía el círculo de las Musas que intervienen igualmente aquí tras el telón. Vemos que de este círculo nace un niño llamado arte social, plástica/ escultura social, que se impone como tarea no sólo de trabajar un material físico cualquiera, sino crear la obra de arte social del futuro. Para toda creación se necesita un fundamento. La sociedad necesita ser sanada y sanar significa transformar al hombre, en el sentido de devolverle sus genuinas capacidades creativas, desarrollando con ellas su libertad. Descubriríamos que, la utilización consciente de la lengua engendra conceptos, y que el mundo – es decir, lo ya dado – aunque esté enfermo, podrá ser labrado con conceptos esenciales, de manera que sea posible una curación. La fórmula de “cada hombre es un artista”, que ha suscitado mucha cólera y que todavía no se entiende, se refiere a la transformación del cuerpo social. Todo hombre puede e incluso debe tomar parte en esta transformación si se quiere lograr esta gran tarea. Pues si falta una sola voz para trabajar en esta plástica social que ha de ser expresada, si una sola voz falta, digo, si no participa, habrá que esperar mucho tiempo antes de llegar a la transformación, a la nueva construcción de las sociedades. Por esto es por lo que he creado fórmulas que tal vez adquieran en la realidad otro aspecto con el paso del tiempo, en el futuro, pero cuyos principios de base son ciertamente justos. Esto significa que, para mí, establecer condiciones, un humus hecho de conceptos y de representaciones sobre el cual pueda realmente crecer una forma viva, se ha convertido cada vez más en el deber de creación, en el imperativo del artista plástico. En este punto de mi discurso, me parece importante decir que no estoy hablando de una cosa en la que haya que creer, sino al contrario, simplemente propongo la cuestión a los hombres, informo sobre un resultado de mi trabajo de taller. Pero cuando afirmo una cosa, no quiero decir que haya que creer en ella. Sólo digo: cada uno debería mirarse a sí mismo, cada uno debería efectivamente formularse a sí mismo como la lengua aquello que exige la sensibilidad y el pensamiento; esto actúa sobre la voluntad, y la voluntad actúa sobre la lengua. Así se desencadena un movimiento en espiral ascendente. Debe despertar en cada ser humano la conciencia, y una conciencia aguda de mí, es decir, una voluntad de afirmación de uno mismo. Es importante saber, a propósito del hombre en el ejercicio de su libertad y llevado por su actividad, que su “yo” es reconocido conscientemente como soberano decididor. Y si el carácter de la autodeterminación es ciertamente elemental, es la única palanca capaz de transformar la sociedad. Esta palanca que debería ser utilizada por el hombre libre, el hombre que se autodetermina, considerado como el verdadero creador del futuro cuerpo social. […] Esto significa que es preciso crear escuelas y universidades libres, centros en los cuales la creatividad sea considerada como una Ciencia de Libertad. Esos centros no tienen necesidad de ser centros físicos. No hay ninguna necesidad de construir grandes edificios. Además, los centros ya existen. Toda persona dotada de un ojo sensible verá este centro en cada uno de sus semejantes. En este sentido es lógico que el artista que se determina a sí mismo – hablo ahora del ser humano como artista – sea el creador. Me apropio de este modo de un concepto de Dios. Me apropio de un concepto de Dios y le doy este concepto al hombre, pero no tengo necesidad de hacerlo, soy demasiado débil. Cristo lo ha hecho. El acto que hará libre al hombre, el acto que representa a Cristo en el ser humano y crea el soberano en el ser humano, este acto ya se ha realizado – pero nos lo callamos. Las ideologías materialistas lo silencian y las Iglesias lo cubren con un silencio de muerte. Éstas son las verdaderas líneas directrices, para decirlo simplemente, de nuestra antropología, de nuestra humanidad que ha pasado en silencio por estos mismos instintos de poder que le han llevado a la decadencia. Insisto aquí que mi objetivo no es criticar, sino indicar una posibilidad: el soberano puede decidir sobre una constitución, y en una democracia habría que pedirle su parecer cuando haya que tomar una decisión vital para su pueblo. Para que nazca un orden económico enteramente nuevo. El hombre que se halla y que vive su vida en tales, digamos, meditaciones, que vive en a apariencia de su libertad, en la sensación de la manera con la que su libertad nace de él, de la manera por su propio trabajo, su preparación, llega a convertirse en una fuerza creativa fabulosa. Y el hombre vivirá por la experiencia de lo que se quiere decir cuando se habla de la lógica de una inserción de la situación central de los derechos del hombre en un organismo social. La única (manera) donde todavía no ha habido abusos (para la transformación social) es la que proviene del arte, de un lejano pasado histórico. […] Y es aquí donde se encuentra el umbral entre, por una parte, el concepto tradicional del arte, el fin de la modernidad, el fin de todas las tradiciones y por otra, el concepto antropológico del arte, el arte social como condición previa a toda capacidad. Cada hombre es un artista. La cuestión es la capacidad de cada uno en su lugar de trabajo, lo que cuenta es la capacidad de una enfermera o un agricultor para convertirse en una fuerza creativa y reconocerla como parte de un deber artístico a cumplir. La ideología es una filosofía de embellecimiento, utilizada y reutilizada corrientemente tanto por el capitalismo privado occidental como por el socialismo tal y como existe. En nuestra búsqueda de la verdad es preciso que nos apartemos rigurosamente de la idea de filosofía como embellecimiento ideológico que sirve a las voluntades de poder. Es naturalmente una tarea de primer orden en la teoría del conocimiento. Esta tarea nos remite al más profundo de los conocimientos antropológicos y a la esencia misma del ser humano. El mundo está lleno de enigmas, pero el hombre es la solución de estos enigmas. Ser “políticamente competente” supone renunciar para siempre a todo potencial de ideas. Esta lengua que, en muchos planos diferentes, nos permite comprender más con detenimiento al ser humano: cómo la lengua trabaja la conciencia humana, a qué nivel de esta conciencia se encuentra el hombre cuando habla conscientemente, se prepara y medita, cómo, a través de esta lengua se forma la conciencia, la conciencia de sí, como proporciona al hombre la capacidad de autodeterminarse y, a consecuencia de ello, de autogenerar todos los lugares de producción, en el sistema productivo de la economía fundada en la división del trabajo. Este concepto de autogestión hace obsoleto al concepto de política. O mejor aún, para todo lo que tengo que decir aquí, no tengo necesidad de recurrir al concepto de política, pues es una descripción esencial del movimiento que conduce a la liberación del trabajo impulsada por las capacidades humanas, es cuando menos lógico que el elemento portador sea primero liberado. El dinero no es en absoluto un valor económico. Los dos auténticos valores económicos son la capacidad (la creatividad) y el producto en la relación que les une. La fórmula del concepto ampliado del arte se explica, así pues, de la siguiente manera: ARTE = CAPITAL. Hoy es posible crear los productos de los que tenemos auténtica necesidad. De todo lo que hoy debemos comprar, según la voluntad de un capitalismo privado ávido de beneficios, no tenemos necesidad! Todo eso que no necesitamos lo conoces bien! deberíamos prohibir todo aquello que nos impida conocernos a nosotros mismos. Tendríamos también leyes económicas que clarificarían la función del dinero, pues la liberación del dinero es una condición de la liberación del trabajo. Esta liberación, que sobrepasa el papel desempeñado por el dinero como producto y medio de intercambio y constituye una fase funcional del derecho – e incluso de los derechos del hombre- provoca enseguida la democratización del proceso monetario. La democracia aparente, que no sirve más que para enmascarar el poder del dinero, se convertirá entonces en una verdadera democracia. En efecto, si el sistema económico actual es ya tan complicado es porque nadie debe comprenderlo a excepción de quienes detentan el poder del dinero. Esto reclama un necesario “segundo apoyo” para nuestra constitución: el referéndum. En la transición, una ley federal sobre el referéndum sería de extrema importancia. Y también sería de extrema importancia que cada uno apoyara iniciativas que ya existen y no dejan de alumbrar aquí y allá para apagarse algún tiempo después. […] Sabemos que esto no es todo, y sabemos también que las cosas avanzan muchas veces paso a paso, escalonadamente. Pero es preciso tomar consciencia de lo que es posible hacer. Aún habría muchas cosas que decir sobre la vida económica. Estamos habituados a ver la vida económica como una configuración de la que se pueden obtener beneficios. Nos olvidamos de lo mejor del ser humano y lo sustituimos por el beneficio. Es natural que los hombres consideren su propio bienestar. Pero sería preciso disociar cada vez más este bienestar del vil egoísmo. Hay que buscar este bienestar mediante una nueva comprensión del trabajo humano, en esta esencia, muy exigente, que demanda que se dé algo al alma, al espíritu, al yo, a la intuición, a la inspiración, a la imaginación. Esto significa que se ha creado en el hombre una pulsión muy compleja para que pueda creer en el dinero – y en su interés por tener dinero. Así que estamos acostumbrados a oír que las empresas del terreno productivo deberán obtener beneficios. Sin esto, no pueden sobrevivir – eso es lo que afirma la ideología. Pero se trata de puro y simple absurdo desde el momento que define la esencia de la economía como una cosa que tiene otro objetivo que el de responder a las necesidades humanas, y esto en todas partes de la Tierra. Y si miro hoy por todas partes de la Tierra, constato que lo que llamamos precisamente economía de mercado, que pretenda satisfacer las necesidades humanas mejor que una economía orientada a las necesidades, deja prácticamente morir de hambre por lo menos a dos tercios de la humanidad. No veo en absoluto la racionalidad de esta economía. Aquellos que ponen a punto otros esquemas o que tratan de desarrollarlos son a menudo, digamos, puestos en la piqueta. Les decimos: ‘es misticismo, no comprenden nada, nadie puede comprender nada, somos nosotros los únicos que lo comprendemos.’ Pero cualquier hombre puede ver hoy que la economía, tal como funciona en la actualidad – tanto bajo la ideología comunista como bajo la ideología del capitalismo privado – no puede en absoluto responder a las necesidades del hombre ni a las necesidades de la naturaleza. Ni siquiera sirve para proveer materialmente cuando haría falta alimento, vestido alojamiento, para sobrevivir y conocer una cierta calidad de vida. Responde todavía menos – por no decir nada en absoluto – a las necesidades del alma humana. Pero cuando la pregunta qué es lo que hay que salvar en este mundo, no me refiero al aspecto material. ni siquiera al cuerpo humano. Todos sabemos que vamos a morir. Lo que hay que salvar es el alma humana. Esta vida debe dejar un fruto tras de sí, debemos poder sentir que esta vida es todo lo que tenemos. Pero para la economía tales puntos de vista son insignificantes, no son siquiera examinados. Podemos constatar y observar que el hombre, cada vez más exisgente en lo que respecta a la evolución de la conciencia de sí y de su libertad, se despega de las redes del egoísmo material. Ciertamente, nuestro egoísmo es todavía fuerte, pero vemos -sobre todo cuando, pasando a la acción, nos consagramos cada vez más a este objetivo – que el hombre sale progresivamente de estas redes. […] Reconoce también que la rama más importante del sector productivo – digo bien el sector de la producción y no del consumo – así pues allí donde la división del trabajo se practica, no en los ámbitos de la actividad de las pequeñas empresas y de las profesiones liberales, sino en las empresas más importantes del sector productivo, esta rama es la de las escuelas y las universidades. Es ahí donde se produce el CAPITAL de la sociedad. Una vez más: el CAPITAL no es el dinero (medio de producción), el CAPITAL son las capacidades y el producto de las capacidades. Vemos aquí aparecer otras pruebas del concepto según el cual “cada hombre es un artista”, que testimonian el papel de la palanca que juegan las capacidades humanas. ¡El dinero no es un valor económico”! ¡No, de ninguna manera es un valor económico! El valor económico es la capacidad que el hombre invierte en el trabajo, es el producto que crea en su lugar de trabajo, ya sea una buena escultura, un cuadro admirable, un coche que no contamina el medio ambiente, una patata santa y buena, un pescado sano que el pescador extrae del mar – y no otro que esté envenenado, lo que hace que no comamos pescado muy a menudo, porque podríamos morir. Ninguna necesidad, desde luego, de adoptar esta ansiedad, esta histeria que marca también muchas veces una comprensión infradesarrollada de la ecología que ofrece la pusilanimidad espiritual. Habría que tener más valor y decirse: el hombre necesita un poco de plomo para hacerse más pesado. “cada hombre es un artista”, es decir con el concepto de libertad, de creatividad orientada al conjunto social. Ésta crea primero un trabajo socio-ecológico que permitirá suprimir de raíz los daños causados al medio ambiente. Bien atendido, tales trabajos los de Greenpeace, por ejemplo, admirables y muy importantes. Todo el mundo debería apoyar a esta gente, es evidente. No puedo subrayar suficientemente la importancia de este fenómeno conjunto social en su lógica, partiendo del hombre creativo como creador del mundo, de la libertad hasta el derecho a nuevas leyes económicas, a un sistema de crédito útil a para Todos. Es preciso crear lo que ayude al mundo. En especial – excelente – producción de bienes, ya sean intelectuales o físicas (vuelvo a las necesidades espirituales del ser humano), es preciso que el ser humano sienta una necesidad cada vez mayor de alimento espiritual. Formadoras de este producto, las escuelas y las universidades son las empresas más importantes en este terreno productivo de la economía. Deben ser libres, de la misma manera que la economía debe ser libre ¡Hoy están estabilizadas! ¿Qué quiere decir esto? Aquéllos que proponen el poder decisorio depositan sobre la libertad el peso de sus ideas que son completamente anquilosadas, o pueden serlo, o más bien lo son, digo bien que lo son […] No quisiera criticar. Pero debo por lo menos decirlo: son anquilosadas, mortales, es una simple constatación. Es una mentira decir que vivimos aquí en una economía libre, en un mundo libre porque las empresas más importantes están estabilizadas. El Occidente no puede afirmar que es libre, frente al socialismo/ comunismo tal como hoy existe que estabiliza todos los bienes de producción, aunque les ponga el nombre de empresas populares ¿Eufemismo? Más bien ¡pura y simple mentira! En nuestro país un sesenta por ciento de las empresas del sector productivo son del Estado; estamos, pues, en el camino del bolchevismo. Y, una vez más, los lugares de producción más importantes para responder a la necesidad creciente de alimento espiritual sentido por el ser humano, son las escuelas y las universidades. Ellas deben estar en manos de hombres libres ¿Funcionarios como ahora? Saca tus propias conclusiones. No pueden ser estabilizadas. Esto implica la liberación de los sistemas escolar y universitario de la empresa del Estado. Es una tarea importante cuya única palanca posible sería la organización en condiciones nuevas de referéndums populares. Vemos también el cuadro de algo que no deja de ocurrir, de algo que pasó muy concretamente en la vida real y que no es sólo una tentativa filosófica, una perspectiva o una opinión personal. Nos esforzamos aquí por presentar las cosas que ocurren en la vida práctica, de tal manera que decimos: ve, esto existe, puedes utilizarlo ahora mismo, necesitas informarte para saber dónde se encuentran los hombres que trabajan en este proyecto y reforzar los grupos de hombres que trabajan allí, eso también es importante para mí, el hecho de que hoy se puedan dar indicaciones concretas sobre la manera en que la transformación pueda ser verificado, con este concepto del arte social. y conocemos las razones de esta enfermedad, es en gran parte el hecho de que la evolución del hombre, desde su infancia hasta el momento en que encuentra un empleo o entra en la universidad, este periodo escolar o universtiario está ocupado por ideologías desarrolladas por los ministerios de la Educación y su opiniones marcadas, determinadas por el Estado y sus opiniones. Estas ideologías no dejan ninguna libertad a los enseñantes ni a los enseñados. Y de esta forma impiden la acción de quienes participan en estas empresas. ¿Creen que una fábrica de zapatos, por ejemplo podría subsistir si el Estado se mezclara con todo lo que pasa dentro de ella? Claro está que hay también fábricas de zapatos estables ¿Pero creen que una empresa medio, en el sistema capitalista privado, soportaría que un ministro le diera perpetuamente su opinión sobre el trabajo realizado por los miembros de las empresas? Es una empresa libre, naturalmente compete a los trabajadores determinar lo que hay que hacer, ya sean los que tiene puestos dirigentes o los que tiene puestos de ejecutantes. Pero no he hablado de un propietario. He hablado de una empresa donde los colaboradores se dan a sí mismos una constitución y se administran ellos mismos. En las escuelas serán los enseñantes y los alumnos, un sistema de equilibro entre enseñar a los otros y enseñarse a sí mismo – pues no es siempre el profesor el que enseña algo a sus alumnos, a menudo sucede que el profesor aprende también de sus alumnos. Es perfectamente evidente que el ámbito del espíritu debe ser desplegado en libertad. Las causas de las dos guerras mundiales residen en la esclavización del espíritu por parte del Estado y la economía capitalista. No existe un organismo para la libertad humana, no hay un organismo para la creatividad, no hay un organismo para el concepto de arte después de la modernidad, incluso esos que tanto celebran el arte, los llamados ‘conocedores’, no han creado ningún organismo ni para el arte ni para las evoluciones que han sido puestas en marca por las catástrofes de la primera y la Segunda Guerra Mundial. Y sin duda, habrá una tercera sino seguimos un nuevo rumbo hacia la ciencia de la libertad, donde reina “cada hombre, un artista”, donde cada uno es él mismo, y donde ese insiste en el soberano que se encuentra dentro de cada hombre. 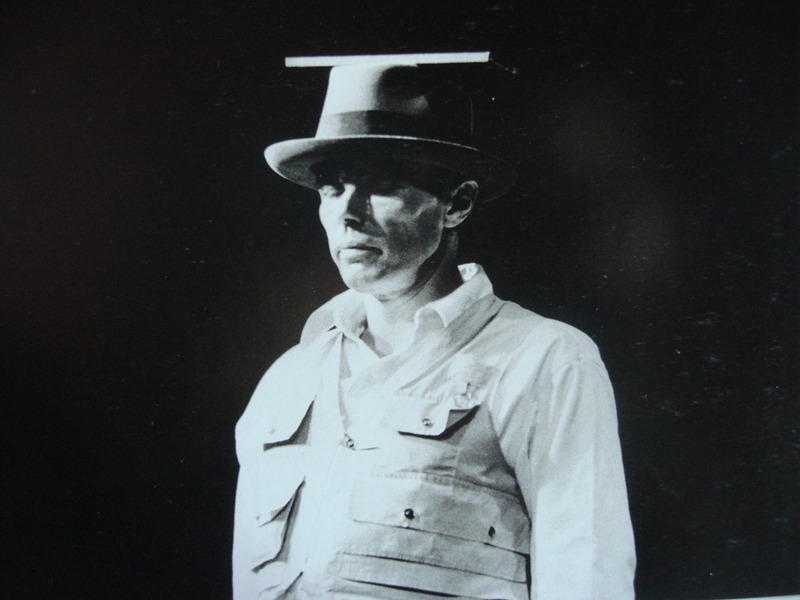 Beuys, J. Par la présente, je n’appartiens plus á l’art, Paris, L’Arche, 1988. Equal Money System is the Project that Beuys would be participating in if he was alive. The economic reform to equalize money as Life. Desteni is a World wide group based on cultivating a dignified living reality for beings through living in Self-Honesty within the consideration of Common Sense, the practical transformation of the individual to establish life-values as an active role to create a new system wherein All can be equally supported. Equality and Oneness is the message that Beuys professed in his lifetime work, this is the basis of Social Sculpture toward a new living reality for humanity.